A unique collection of primary care indicators for quality improvement in family practices. By Cheryl Levitt, family physician and Linda Hilts, family practice nurse. 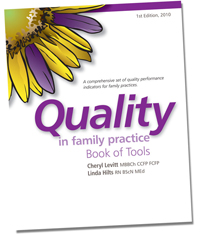 The book developed from a rigorous research process and pilot testing in the Quality in Family Practice Program a partnership between McMaster University and the Ontario College of Family Physicians.